Boswellia Extract 250 mg Plus Turmeric Root by NOW significantly reduced the pain in my knees. I am now able to perform aggressive lower body workouts with only a little soreness. I was taking 4 NSAID's a day now I do not have to take any. Felt relief from joint soreness and cranky shoulders in just a few days. 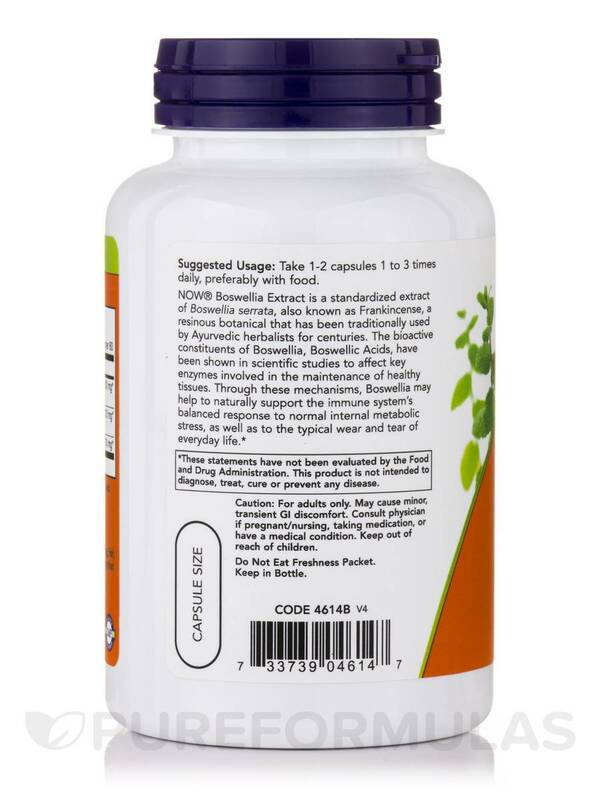 This Boswellia Extrat 250 mg Plus Turmeric Root by NOW seems to be helping with knee pain. NOW® Boswellia Extract is a standardized extract of Boswellia serrata‚ also known as Frankincense‚ a resinous botanical that has been traditionally used by Ayurvedic herbalists for centuries. The bioactive constituents of Boswellia‚ Boswellic Acids‚ have been shown in scientific studies to affect key enzymes involved in the maintenance of healthy tissues. Through these mechanisms‚ Boswellia may help to naturally support the immune system’s balanced response to normal internal metabolic stress‚ as well as to the typical wear and tear of everyday life. Other Ingredients: Cellulose (capsule)‚ rice flour‚ silica‚ and magnesium stearate (vegetable source). Take 1-2 capsules 1 to 3 times daily‚ preferably with food. May cause minor‚ transient GI discomfort. 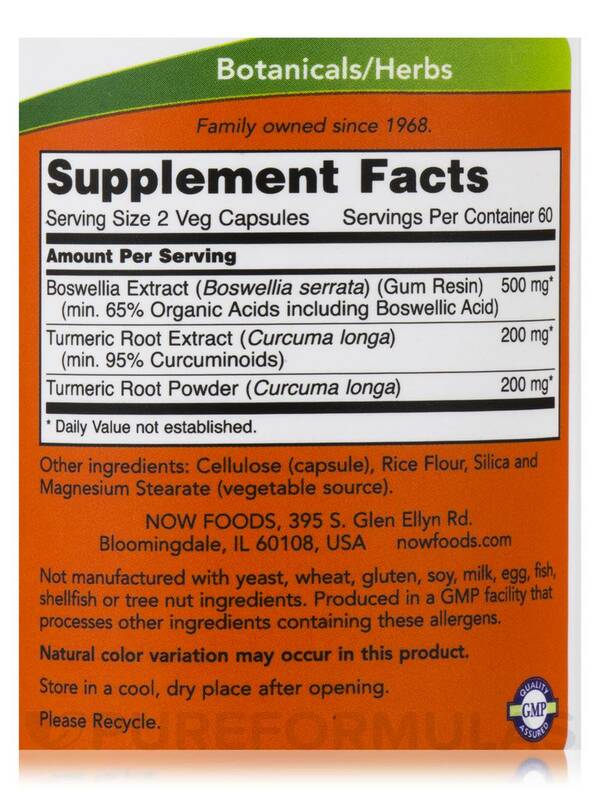 I ordered this Boswellia Extract Plus Turmeric Root by NOW to see if it will help with inflammation. This is another product that helps with reducing inflammation. I just take 1 capsule a day. Helps joint pain, respiratory system, helps with stomach bloatin. 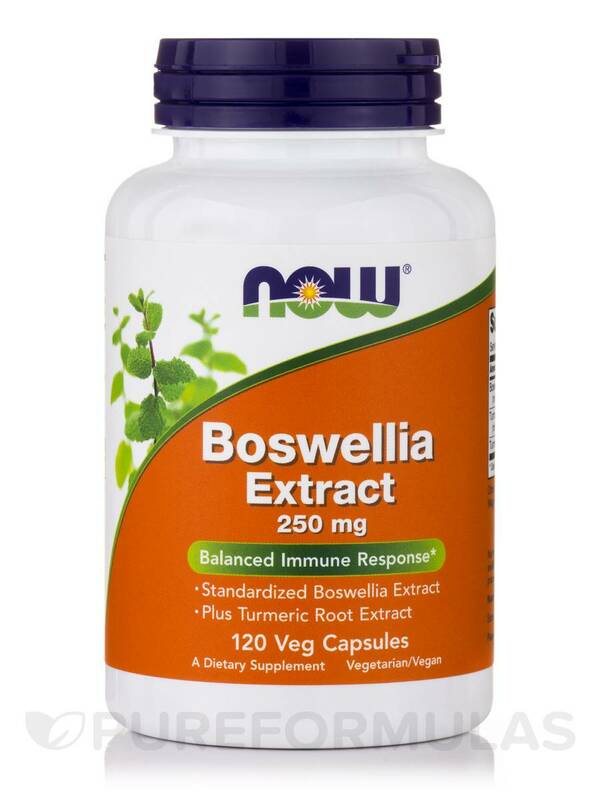 I have MS. One of my doctors recommended Boswellia Extract Plus Turmeric Root by NOW for me to try. I felt sick to my stomach. MS is tricky. May work well for others, I know my doctor's wife uses it. Wonderful benefits with Boswellia Extract 250 mg Plus Turmeric Root by NOW, however the pill are quite large in size! Boswellia Extract 250 mg Plus Turmeric Root by NOW is the "go to" supplement for joint pain instead of using other prescription methods and it helps so much it allows you to get a decent good night sleep. I started taking Boswellia Extract 250 mg Plus Turmeric Root by NOW to see if it would help with the knee pain I experience when hiking. I started taking it about 6 weeks before I knew I would be hiking in the mountains. I have tried it during several hiking trips. When I take this supplement, I have no knee pain, even when hiking several days in a row. Before I took it, I would have pain when coming downhill after 1 day of hiking. I am very pleased that I can hike now without pain. I eliminates my knee pain. Sometimes after taking it, I have bad tasting burps. I was happy to find Boswellia Extract 250 mg Plus Turmeric Root by NOW which combines Boswelia with both tumeric extract and tumeric root. I was taking these separately, so this combo is a plus. Combo product , (convenience) and price. 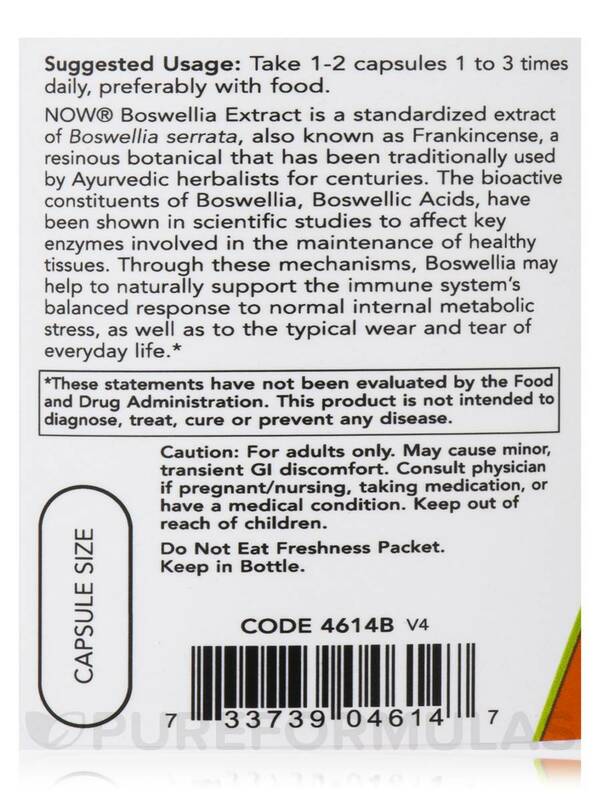 Boswellia Extract 250 mg Plus Turmeric Root by NOW helped with my pain but killed my stomach! Can't take the stuff! It's rough on bad stomachs! If you have a bad stomach don't touch this you'll be sorry. I wake up with arthritis pain every morning and will not take drugs. 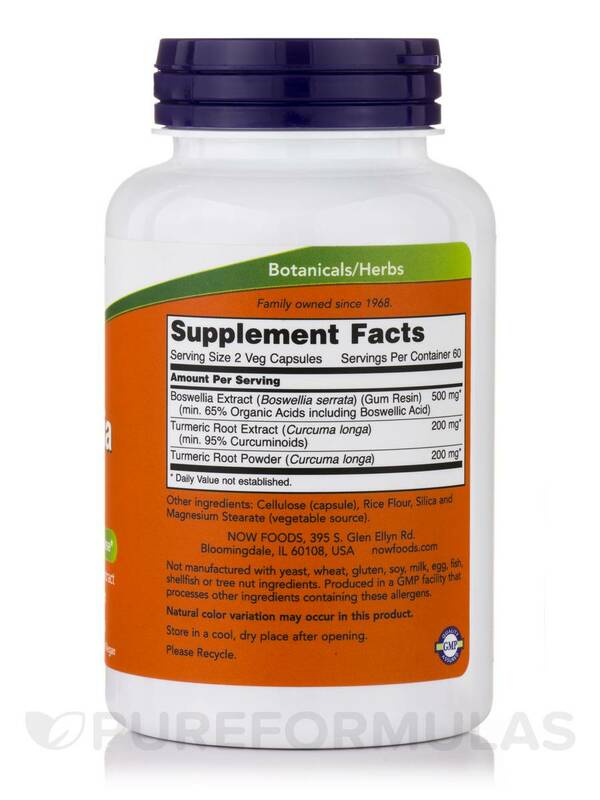 Boswellia Extract 250 mg Plus Turmeric Root by NOW has me able to function well within a short time. It works well to ease pain I suffer throughout each day without having to take drug pain killers.....ych!